There is one thing concerning on the minds for all of those involved in high schools athletics right now. That is a potential shortage of officials. In our home state of Michigan, a Lansing State Journal article written by Eric Lacy states “For nine straight academic years, the Michigan High School Athletic Association has seen the number of registered officials for sporting events drop.” It’s not just happening in Michigan, but all across the country. The reasons for this are well known. Officials are retiring at a faster rate than new officials are coming in. Unfortunately anger from some parents and coaches is also contributing to this. “One of the most challenging parts of officiating is the small, but vocal, fans that use their energy to berate us. “General groaning or booing is to be expected, it’s the insults that are tough. There’s not always much that can be done,” said veteran official of 15 years Chris Dennie. “I like to interact with some of the fans in the crowd pre-game or during breaks so they can see us as regular people.” While there are some tough times, there are so many positives to becoming an official. Here are 9 reasons why you should become a referee. There are plenty of great ways to give back to sports you once played. Officiating is a way you can stay involved. Whether its once a month, or three times a week, there’s always something you can do when it comes to officiating. Options include working with youth, middle school, high school, and more! Looking for a way to earn additional income? Officiating is a great way to make it happen. According to an article in USA Today, you can make up to $1,000 a week refereeing multiple events. Officiating is hard. There’s no doubt about it. While it can be easy sitting in the stands to get frustrated with officials, it is likely they probably know more about the game than we do. Officials know the rules of their sport inside and out. Get bragging rights next time you’re watching the big game with your family and you can make the call on the field. Depending on the sport you’re looking to officiate, there are definitely options to become more active and exercise. Football and soccer officials certainly will get their exercise in as they keep up with play. Another great sport to officiate that will burn some calories is hockey. If there aren’t enough officials in the near future, it could be disastrous for high school athletics as a whole. Games could be cancelled, seasons could be shortened, or worse. 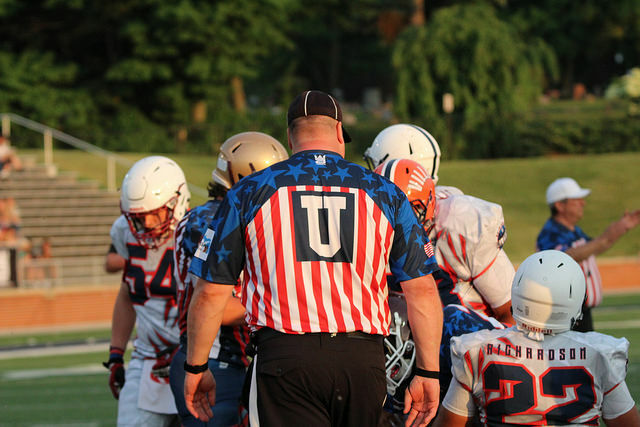 By becoming an official, you’re helping athletes enjoy the games they love without having to worry about an officiating shortage. Veteran official of 15 years, Chris Dennie, has the unique excitement of officiating on some occasions with his son. “Working with him is really cool. It’s fun to try to teach him and see him get better. Just to spend that time with him has made those games we worked together really special. Traveling is one of the great perks of officiating. Our country is full of unique towns, landmarks, and schools. There are unique athletic venues all around for high schools as well. Lets face it who wouldn’t want to wear the striped gear the officials have? Maybe you’ll be wearing some Addix officiating gear in the near future! From youth to high school to college and even the pros, there are many opportunities that await you when you decide to become an official. No doubt, these will take years to work towards your goal. Who knows, you could be the official in Super Bowl 76! For those interested please contact your state’s athletic association.